The normal concentration of potassium in the serum is in the range of 3.5 to 5.0 mM. Hyperkalemia refers to serum or plasma levels of potassium ions above 5.0 mM. The concentration of potassium is often expressed in units of milliequivalents per liter (mEq/L), rather than in units of millimolarity (mM). Both units mean the same thing when applied to concentrations of potassium ions. A normal adult who weighs about 70 kg contains a total of about 3.6 moles of potassium ions in the body. Most of this potassium (about 98%) occurs inside various cells and organs, where its concentration is about 150 mM. This level is in contrast to the much lower concentration found in the blood serum, where only about 0.4% of the body's potassium resides. Hyperkalemia can be caused by an overall excess of body potassium, or by a shift from inside to outside cells. For example, hyperkalemia can be caused by the sudden release of potassium ions from muscle into the surrounding fluids. In a normal person, hyperkalemia from too much potassium in the diet is prevented by at least three types of regulatory processes. First, various cells and organs act to prevent hyperkalemia by taking up potassium from the blood. It is also prevented by the action of the kidneys, which excrete potassium into the urine. A third protective mechanism is vomiting. Consumption of a large dose of potassium ions, such as potassium chloride, induces a vomiting reflex to expel most of the potassium before it can be absorbed. Hyperkalemia can occur from a variety of causes, including the consumption of too much of a potassium salt; the failure of the kidneys to normally excrete potassium ions into the urine; the leakage of potassium from cells and tissues into the bloodstream; and from acidosis. The most common cause of hyperkalemia is kidney (or renal) disease, which accounts for about three quarters of all cases. Kidney function is measured by the glomerular filtration rate, the rate at which each kidney performs its continual processing and cleansing of blood. The normal glomerular filtration rate is about 100 ml/min. If the kidney is damaged so that the glomerular filtration rate is only 5 ml/min or less, hyperkalemia may result, especially if high-potassium foods are consumed. The elderly are at particular risk, since many regulatory functions of the body do not work well in this population. Elderly patients who are being treated with certain drugs for high blood pressure, such as spironolactone (Aldactone) and triamterene (Dyazide), must especially be monitored for possible hyperkalemia, as these medications promote the retention of potassium by the kidneys. Hyperkalemia can also be caused by a disease of the adrenal gland called Addison's disease. The adrenal gland produces the hormone aldosterone that promotes the excretion of potassium into the urine by the kidney. Hyperkalemia can also result from injury to muscle or other tissues. Since most of the potassium in the body is contained in muscle, a severe trauma that crushes muscle cells results in an immediate increase in the concentration of potassium in the blood. Hyperkalemia may also result from severe burns or infections. Acidic blood plasma, or acidosis, is an occasional cause of hyperkalemia. Acidosis, which occurs in a number of diseases, is defined as an increase in the concentration of hydrogen ions in the bloodstream. In the body's attempt to correct the situation, hydrogen is taken up by muscle cells out of the blood in an exchange mechanism involving the transfer of potassium ions into the bloodstream. This can abnormally elevate the plasma's concentration of potassium ions. When acidosis is the cause of hyperkalemia, treating the patient for acidosis has two benefits: a reversal of both the acidosis and the hyperkalemia. Symptoms of hyperkalemia include abnormalities in the behavior of the heart. 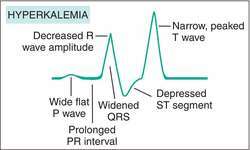 Heart abnormalities of mild hyperkalemia (5.0 to 6.5 mM potassium) can be detected by an electrocardiogram (ECG or EKG). With severe hyperkalemia (over 8.0 mM potassium), the heart may beat at a dangerously rapid rate (fibrillation) or stop beating entirely (cardiac arrest). Patients with moderate or severe hyperkalemia may also develop nervous symptoms such as tingling of the skin, numbness of the hands or feet, weakness, or a flaccid paralysis, which is characteristic of both hyperkalemia and hypokalemia (low plasma potassium). Hyperkalemia can be measured by acquiring a sample of blood, preparing blood serum, and using a potassium sensitive electrode for measuring the concentration of potassium ions. Alternatively, atomic absorption spectroscopy can be used for measuring potassium. Since high or low potassium levels result in abnormalities in heart function, the electrocardiogram is usually the method of choice for the diagnosis of both hyperkalemia and hypokalemia. Insulin injections are used to treat hyperkalemia in emergency situations. Insulin is a hormone well known for its ability to stimulate the entry of sugar (glucose) into cells. It also provokes the uptake of potassium ions by cells, decreasing potassium ion concentration in the blood. When insulin is used to treat hyperkalemia, glucose is also injected. Serum potassium levels begin to decline within 30 to 60 minutes and remain low for several hours. In non-emergency situations, hyperkalemia can be treated with a low potassium diet. If this does not succeed, the patient can be given a special resin to bind potassium ions. One such resin, sodium polystyrene sulfonate (Kayexalate), remains in the intestines, where it absorbs potassium and forms a complex of resin and potassium. Eventually this complex is excreted in the feces. A typical dose of resin is 15 grams, taken one to four times per day. The correction of hyperkalemia with resin treatment takes at least 24 hours. The prognosis for specifically correcting hyperkalemia is excellent. However, hyperkalemia is usually caused by kidney failure, an often irreversible and eventually fatal condition. Healthy people are not at risk for hyperkalemia. Patients with renal disease and those on certain diuretic medications must be monitored to prevent its occurrence. Greenberg, A. "Hyperkalemia: treatment options." Seminars in Nephrology 18 (1998): 46-57. Acidosis — An abnormally high acid (hydrogen ion) concentration in blood plasma. The unit of acid content is pH, with a lower value indicating more acidic conditions. Blood plasma normally has a pH of 7.35-7.45. Alkaline blood has a pH value greater than pH 7.45. When the blood pH value is less than 7.35, the patient is in acidosis. abnormally high potassium concentration in the blood, most often due to defective renal excretion, as in kidney disease, severe and extensive burns, intestinal obstruction, or addison's disease. See table of Electrolyte Imbalances at electrolyte. adj., adj hyperkale´mic. Potassium levels greater than 7 mEq per liter can produce electrocardiographic abnormalities, which are first evident as peaked T waves and depressed P waves; later there are widened QRS waves; and eventually there will be asystole. Other signs and symptoms include muscular weakness, tingling of the hands, feet, and tongue, and a slow irregular pulse. As the amount of serum potassium continues to rise to above 8 mEq per liter, there is potential for respiratory paralysis, asystole or ventricular fibrillation, and cardiac arrest. Treatment consists of removing the excess potassium from the body with dialysis, or giving intravenous sodium bicarbonate, calcium, or hypertonic glucose and insulin to shift potassium into the cells. Cation exchange resins may also be given orally or by enema to remove potassium. A greater than normal concentration of potassium ions in the circulating blood. An abnormally high concentration of potassium ions in the blood. greater than normal amounts of potassium in the blood. This condition is seen frequently in acute renal failure, massive trauma, major burns, and Addison's disease. Early signs are nausea, diarrhea, and muscle weakness. As potassium levels increase, marked cardiac changes are observed in the electrocardiogram. Treatment of severe hyperkalemia includes oral administration of Kayexalate (sodium polystyrene sulfonate) and IV administration of sodium bicarbonate, calcium salts, and dextrose. Hemodialysis is used if these measures fail. Also spelled hyperkalaemia. Higher than normal concentration of potassium ions in circulating blood. n an abnormally elevated concentration of serum potassium. It may occur in renal failure, shock, and advanced dehydration, and in association with high intracellular potassium in Addison's disease. The normal adult range of serum potassium is 4.0 to 5.5 mEq/L. abnormally high potassium concentration in the blood, most often due to defective renal excretion, as in kidney disease, severe and extensive burns, intestinal obstruction, diabetes mellitus, acute renal failure and hypoadrenocorticism. High blood potassium levels can produce electrocardiographic abnormalities evident first as elevated T waves and depressed P waves, and eventually by atrial asystole. Other clinical signs include muscular weakness and a slow irregular pulse. As the amount of serum potassium continues to rise there is potential for respiratory paralysis, asystole or ventricular fibrillation, and cardiac arrest. hyperkalemia, clinical signs, radiography and ultrasonography). Hyperkalemia often has no symptoms, but an irregular heartbeat is the most likely if they do occur, so if your heart seems to be racing or skipping beats, contact your doctor immediately. 44 (44%) of patients had mild, 33 (33%) had moderate, and 23 (23%) had severe hyperkalemia. There is still no conclusive evidence for nebivololinduced hyperkalemia in medical literature because case reports are lacking. Hypoaldosteronism, therefore, will result in hyponatremia, hypochloremia, hyperkalemia, metabolic acidosis, and dehydration. a biopharmaceutical company, today announced that the Phase 4 TOURMALINE study, which compared the efficacy and safety of Veltassa (patiromer) for oral suspension given with or without food for the treatment of hyperkalemia, met its primary endpoint. Its lead product, Veltassa, was approved by the US Food and Drug Administration for the treatment of hyperkalemia in October 2015. Veltassa is the first medicine for treatment of people with elevated blood potassium levels to be approved in the United States in more than 50 years and the only hyperkalemia medicine with long-term data in its label supporting chronic use. According to the company, the proceeds will be used for Phase 3 development of tenapanor for IBS-C and hyperphosphatemia; development of RDX227675 for hyperkalemia; completion of the first registration trial for tenapanor for hyperphosphatemia in ESRD patients on dialysis; completion of T3MPO-1 and T3MPO-2 tenapanor Phase 3 clinical trials for irritable bowel syndrome with constipation; completion of onset-of-action clinical trial in patients with hyperkalemia with RDX227675; and the filing of an IND and completion of the first Phase 1 clinical trial for RDX98940 for potential use in certain GI and metabolic disorders.